"The State Botanical Garden Of Georgia's Hummingbird Trail"
This is one of the new signs that are displayed at The State Botanical Garden of Georgia for the new Hummingbird Trail. If you missed the first post about the Hummingbird Trail please view here. 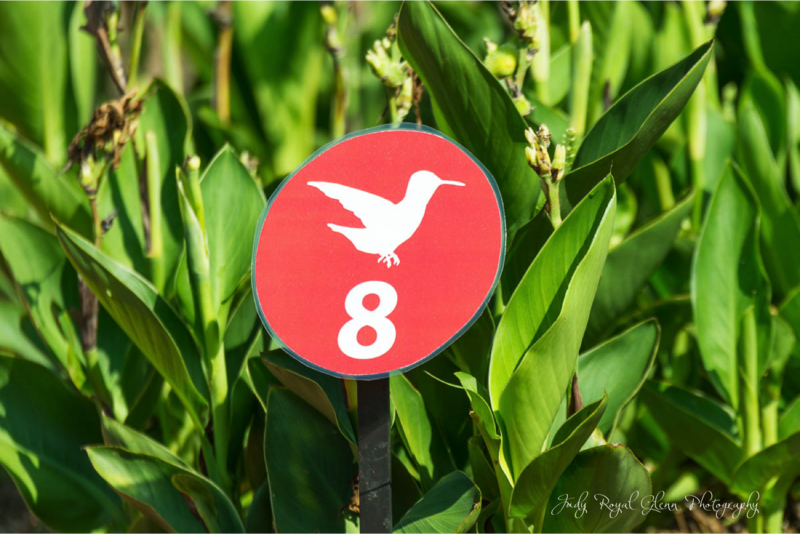 These red markers can be found throughout the garden to display where the hummingbirds can be found feeding or perching in their natural habitat. This photograph of an immature male Ruby-throated hummingbird was taken at marker #6. He is feeding on the purple salvia. I have enjoyed seeing my vision of the Hummingbird Trail come to fruition, and I am appreciative of The State Botanical Garden of Georgia in believing in this project. If you are ever in Athens, come wander through the Hummingbird Trail and see these neatest little creatures in their natural habitat! I enjoy looking at this photograph in black and white. It makes all the intricate details of the flower really stand out. 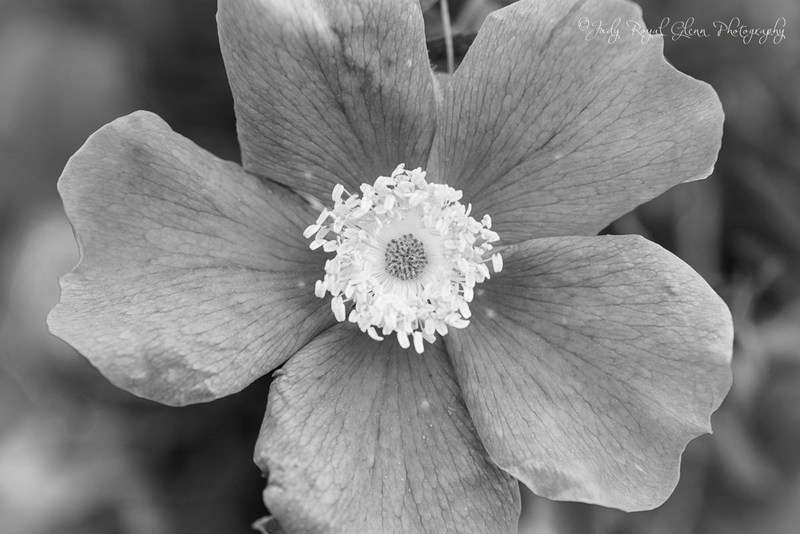 If the photograph were in color, it would not have the same impact because the color of the flower would over power the shot. This is the first time I have uploaded a photograph from my iPhone. 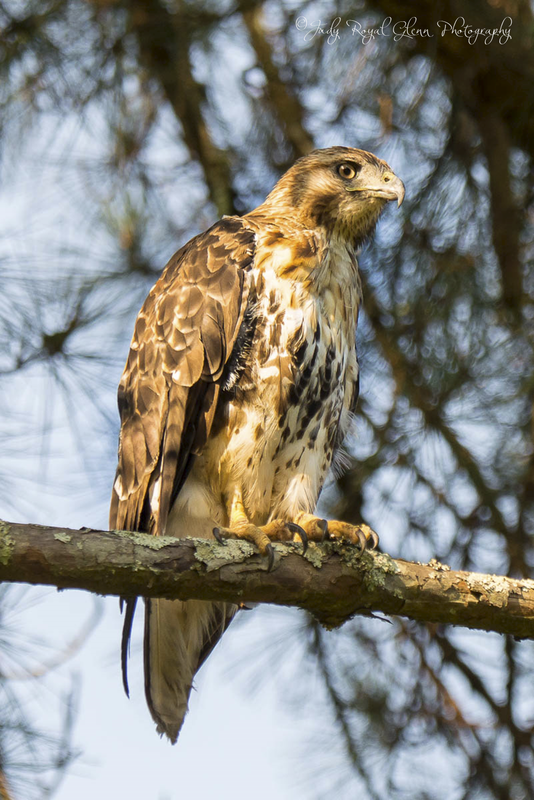 After a friend and I finished walking the Hummingbird Trail at The State Botanical Garden of Georgia, we walked around to see if we could find the resident hawk. 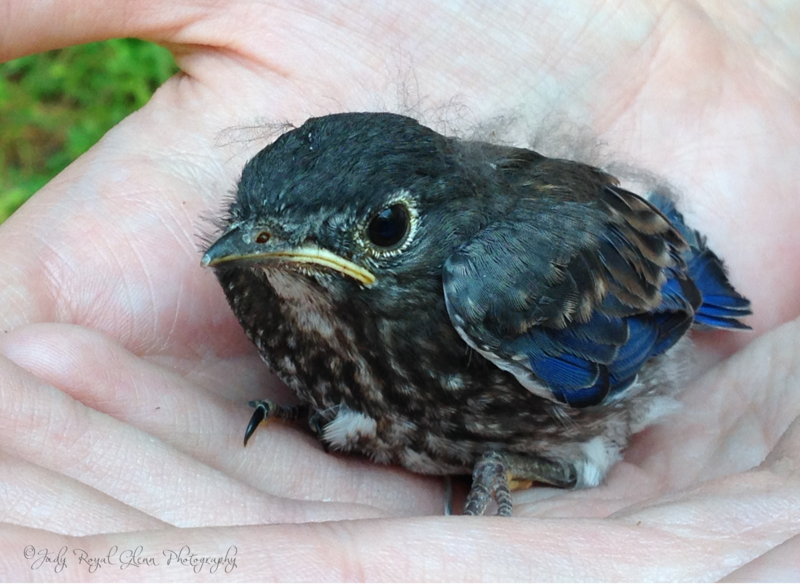 As we were walking down a path, Heather noticed this baby bluebird in the middle of the path in the blistering sun. He was exhausted and was very still. She picked him up, and I took a few photographs with my iPhone of the him in her hands. She also had her camera with her, and I was glad she took a photograph for me. He was hot and exhausted, so we put him in the shade next to the road where we found him. We walked away and watched to see if the mom and dad would help him. Confident is was okay, we left. This hawk lives at the State Botanical Garden of Georgia and is not bothered at all by humans. I know several people that have photographed him from very short distances. He has several perches where he loves to hang out, and I knew just where to look for him this morning. As I was walking down a path near one of his favorite perches, he flew overhead to a large patch of very tall grass and attempted to pounce on something. I hurried closer, and he sprung up in the air and pounced once more. Whatever he was after, he did not get because he flew up to his perch in the tree. He sat there undisturbed as I took my photographs! He did not want to disappoint! I never post on a Saturday, but I was excited about the Hummingbird Trail being officially "open" today at The State Botanical Garden of Georgia. I lead a group of people through the trail this morning and showed them where the hummingbirds hide at the garden. There are 20 markers showing where the hummingbirds love to fed, perch, and hide. There are maps located in the Visitor Center for people to pick up and walk the trail at their leisure. I photographed this particular hummingbird three weeks ago hiding in the Pineapple Guava shrub which is at marker #3. The hummingbirds were quite shy today as we had over 20 people attend the ramble. I did have one visitor tell me after the crowds left, she saw a number of hummingbirds around this area. This is most of the crowd that showed up for the Hummingbird Trail. 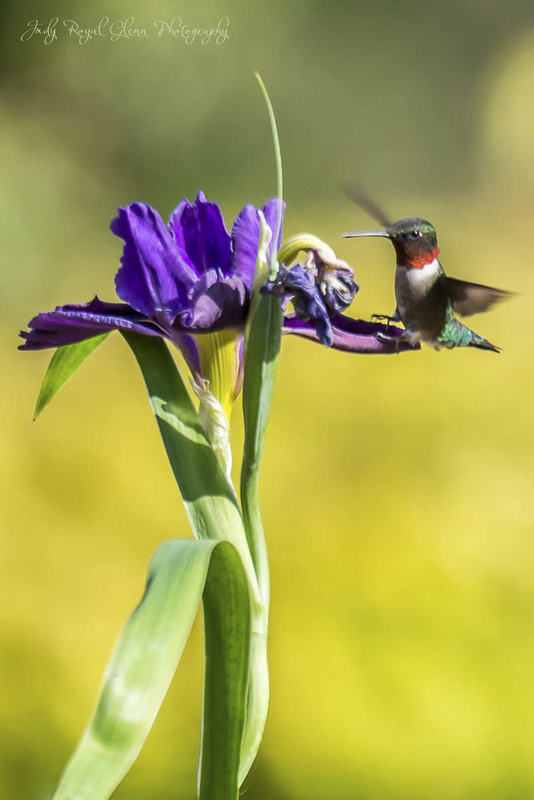 I spent a good amount of time in the Iris garden this spring at the State Botanical Garden of Georgia trying to determine how much and often the Ruby-throated hummingbird fed off of the iris flower. Last year was the first time I captured a photograph of the hummer feeding off of the iris, so I knew I needed to do more research. This particular day, I had my camera focused on a different section of the flowers. This male made his presence know either by the hum of his wings or the cute squeaks they make. I quickly focused on the flower he was feeding on and fired a few shots. I have been extensively researching the hummingbirds within the garden for the last four summers. After spending a lot of time in the garden doing research, I noticed they were perching on their favorite perches just as much as feeding on certain flowers, so I set on a quest to find their perches so I could photograph them. This led to the obsession I have now for photographing them in the garden. I kept a small journal writing down all of my notes for the last four years. I felt I had a vast amount of information that was benefiting me greatly in photographing the Ruby-throated hummingbird, but I did not want to keep this information to myself. I knew where to find the hummingbirds, but I wanted others to know as well! I shared my vision of a Hummingbird Trail to the State Botanical Garden of Georgia, and we have come up with a map for the visitors to view. The map shows 20 markers where the hummers frequent within the garden. The map is surrounded with my photographs showing the visitors what the flower and location look like. Some of the markers also display various trees where the hummers love to perch. Red signs with the marker number and hummingbird symbol will be at each location in case the visitors do not have a map or know there is a hummingbird trail. 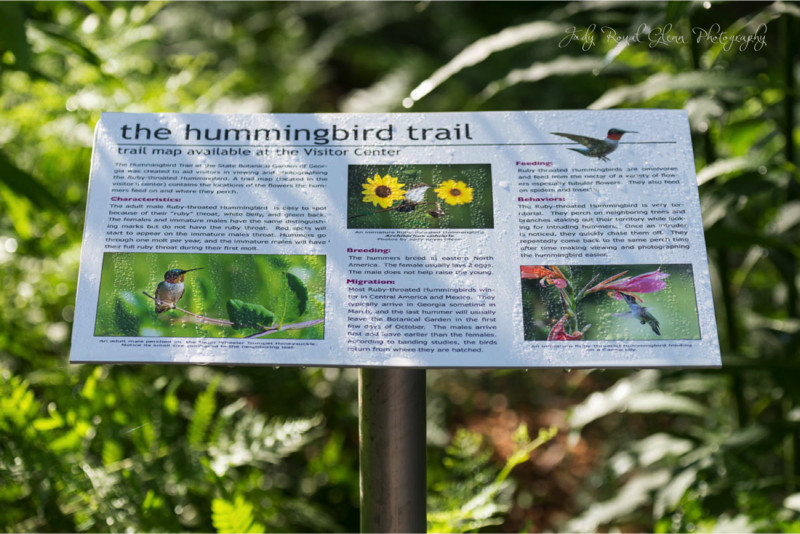 Placards will be on display where the visitors enter the garden informing them of the trail, and the placard will also have information about the Ruby-throated hummingbird on it. The Hummingbird Trail in Athens, Georgia officially "opens" tomorrow as I will be leading the first ramble. The ramble is open to everyone. During the ramble, I will be leading visitors through the trail showing them where the hummingbirds hid, perch, and feed throughout the garden. 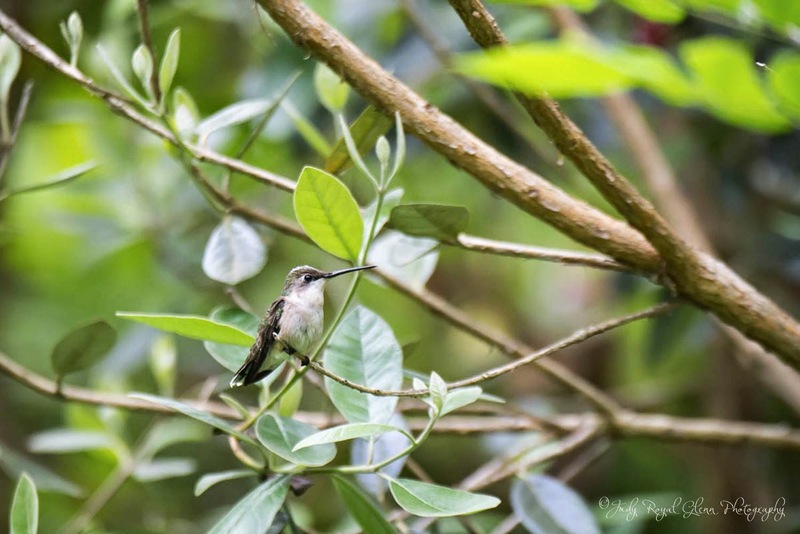 The trail is not just for photographers, but bird watchers or anyone just wanting to enjoy seeing the hummingbirds in their natural habitat. 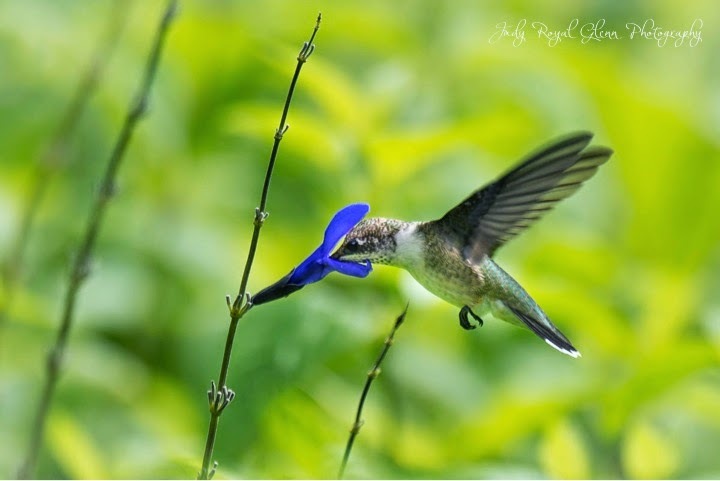 I will be sharing about how to find the hummingbirds in their natural habitat, and talk about the neat characteristics of the hummingbird as well as the flowers they feed on. 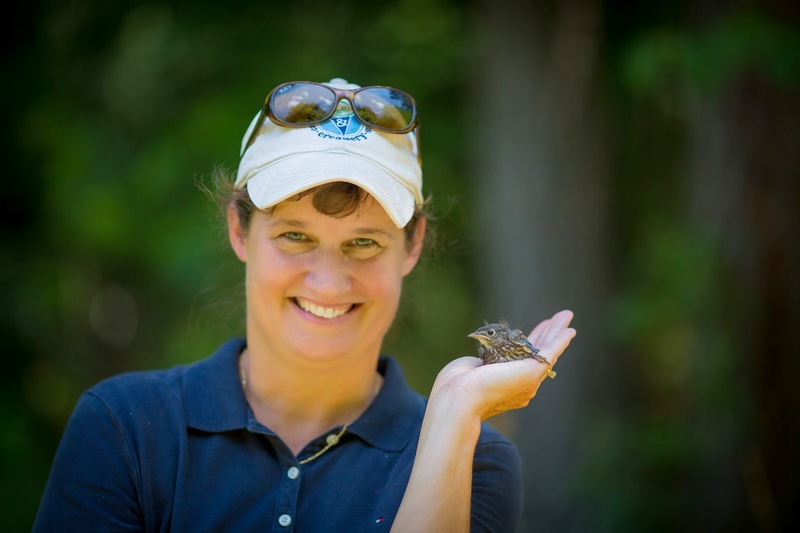 I am extremely grateful to the State Botanical Garden of Georgia for allowing me the privilege of sharing my vision of the Hummingbird Trail to Athens, Georgia! I am excited about the trail and giving back to my community! This photograph represents much more than it appears. It just looks like a shell resting at the water's edge. My dad's wife (Claudia) owns a condo on St. Simons Island, Georgia. When we were staying there recently, I noticed this beautiful shell in her condo. I wanted to take the shell to the beach and use my new wireless remote so I can keep my shutter open for long periods of time while the tide rushed in and out. 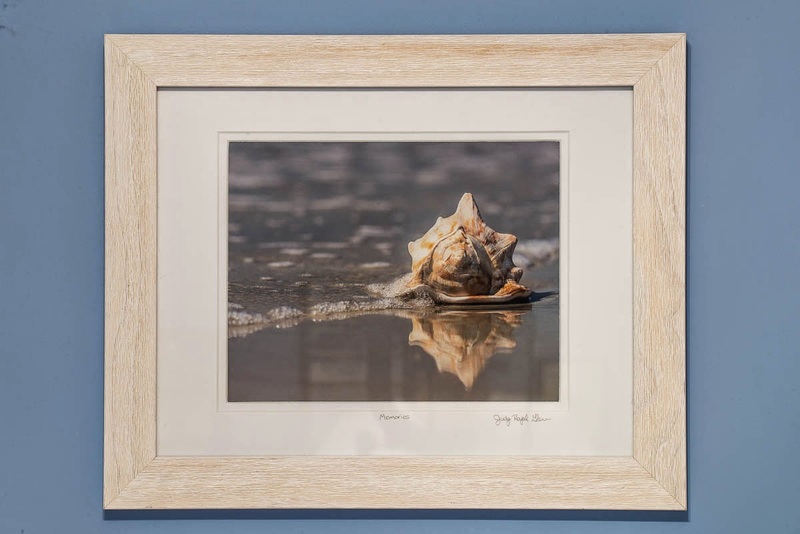 I did use the shutter release, and then I shot some normal photographs of the shell at the water's edge. 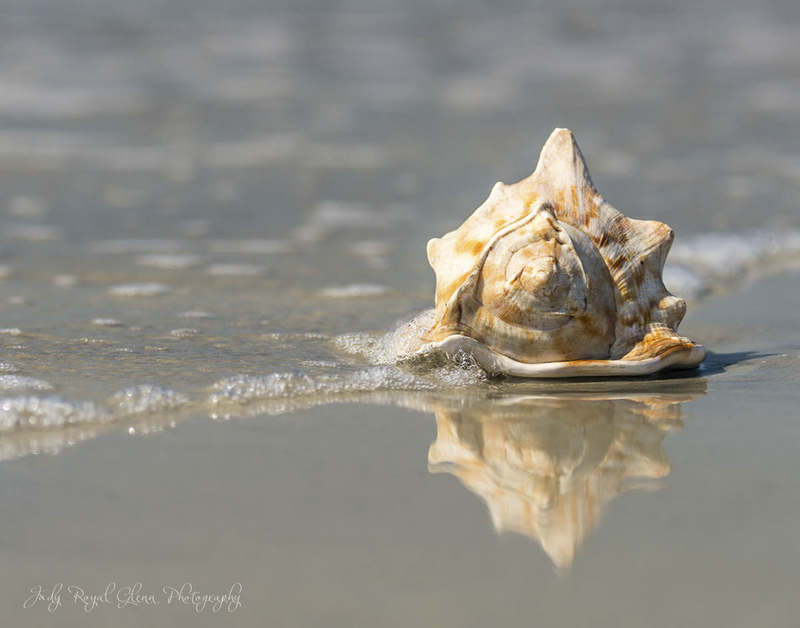 When I asked Claudia if I could take the shell to the beach, she told me to be very careful with it because her grandmother found it on the beach in Fernandina, Florida. I wanted to give her the framed print for her birthday. So, when my family got together this past weekend for our annual trip, my sisters and I gave it to her as a gift. I did not know what to title it, so I can up with "Memories" because the photograph would always remind her of her grandmother. 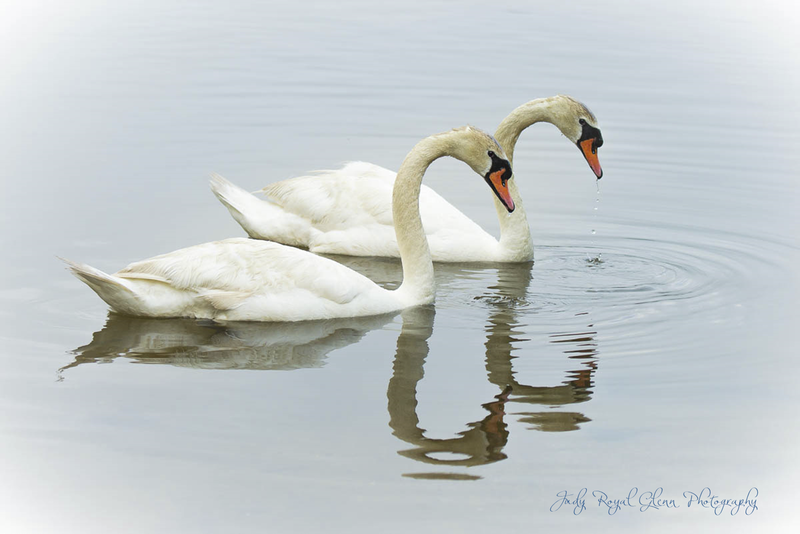 I waited by the lake for a while for the swans to both have their heads out of the water as they were feeding. They were enjoying playing teeter totter. One would go under water to feed and then when he came up the other went down to feed. Persistence pays off! 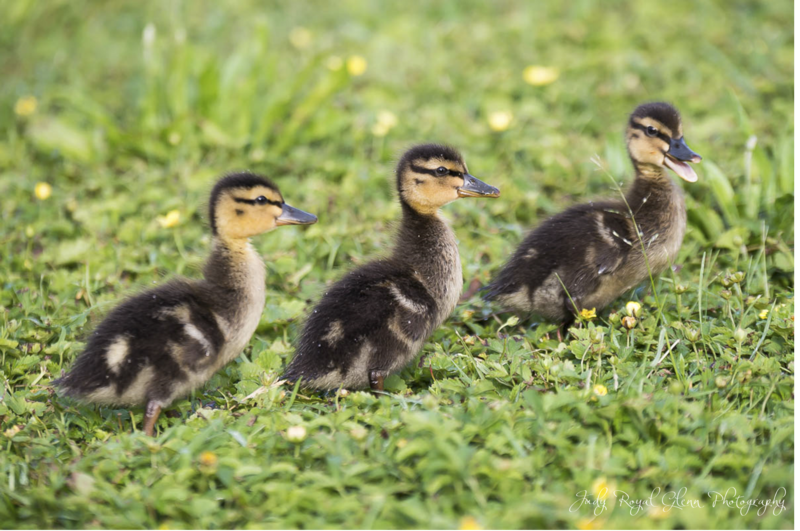 Will, a photographer buddy of mine was photographing above the baby ducks and helped wrangle them towards my lens. Thanks Will! 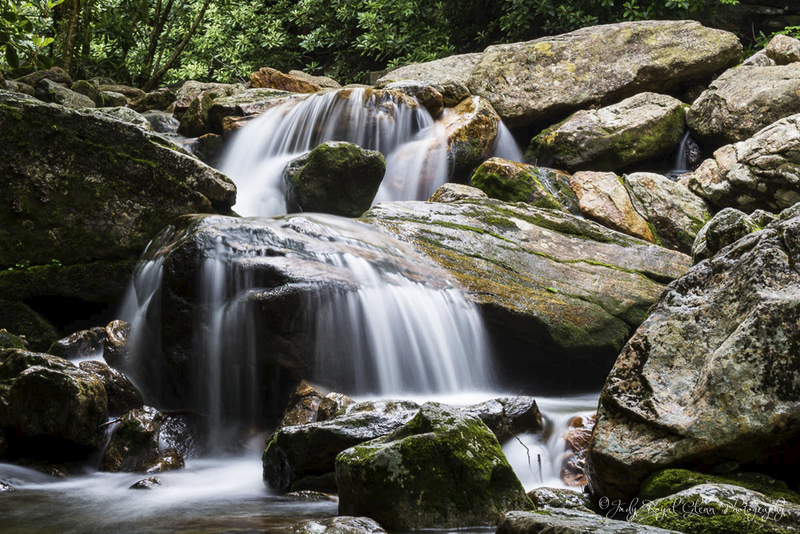 I recently attended the Blue Ridge Mountains Christian Writers Conference. One of my favorite things to do is hike to the lake. It is so tranquil and quiet. 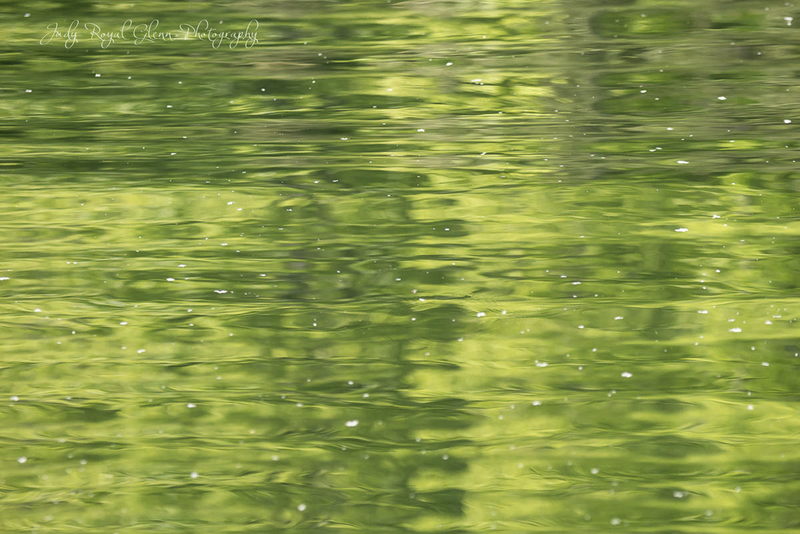 I took my camera and wanted to photograph the beautiful reflections in the lake. A floating dock rests on the lake with a place to sit, inviting people to come and relax. I tried hard not to move the dock by walking slowly so I would not disturb the calm waters. The smallest movement I made though caused ripples. The ripples traveled all the way to the other side of the lake. As with my writing, and trying to get my book published, even though I am one, I can make a difference. My impact can reach those on "the other side of the lake." We all make "ripples" in our lives. What good is being caused by the "ripples" in your life? 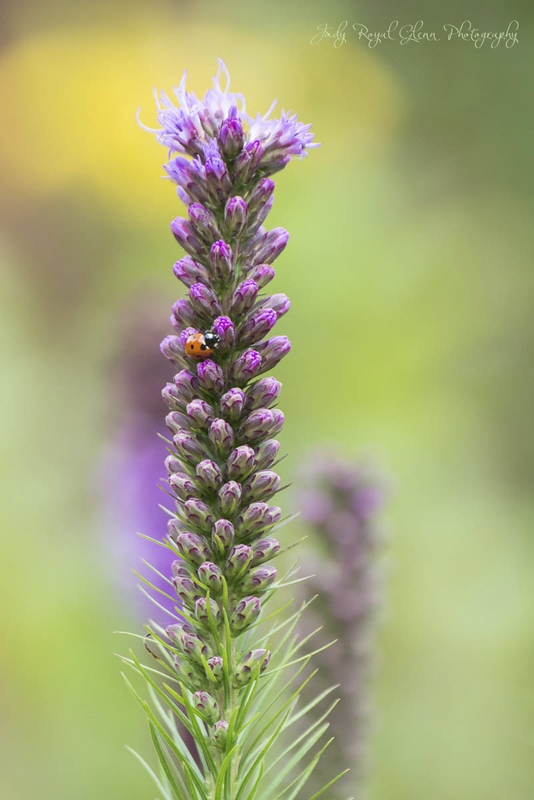 A ladybug wanted me to photograph him, so when he landed on my arm, I quickly escorted him to the pretty purple Gayfeather. We had a great photo session! I have started calling the Japanese iris Jason's iris because of this story. The story of the photograph I took of the two miracles continues to grow. Read the story here about the miracles so this part of the story will make sense. The second part of the story can be found here. I went to a Christian writer's conference a few weeks ago, and I was telling a faculty member about the miracles I photographed. She asked me if I had looked up the meaning of the Japanese iris, and I told her no. The Japanese iris means "rainbow." The meaning of the rainbow is indicative of God's promises. After reading the story, what does the meaning of the flower have to do to with the story to you? I can not put it into words, but started getting teary eyed as I found out the meaning. 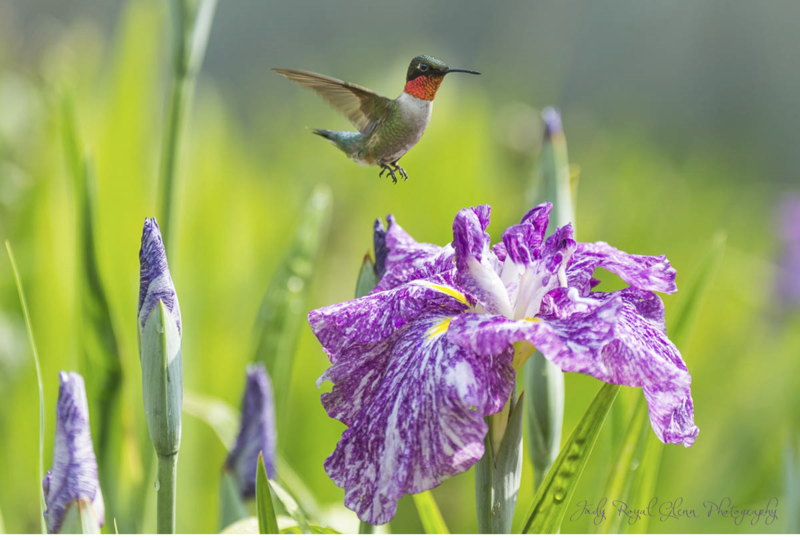 Recently, I quit taking photographs in the iris garden because there were thousands of plants blooming, and there is no way I would be able to photograph a hummingbird. On May 27th, when I came back to the garden, only the Japanese iris and a few others were blooming, so I knew I had a much better shot of photographing a hummingbird at the Japanese iris. I set up my tripod about six feet away from the prettiest flower and pointed my camera at the flower. I knew it was risky because I might be a little too close, but it was the shot I wanted. Then there he was, six feet in front of me feeding off the flower. I fired off three shots and said, "I hope I got one." I was thrilled to capture the photo above. If you look at the two petals on the right, there is a green heart shape between the petals! This photo was taken at marker #20 of the new Hummingbird Trail at The State Botanical Garden of Georgia. 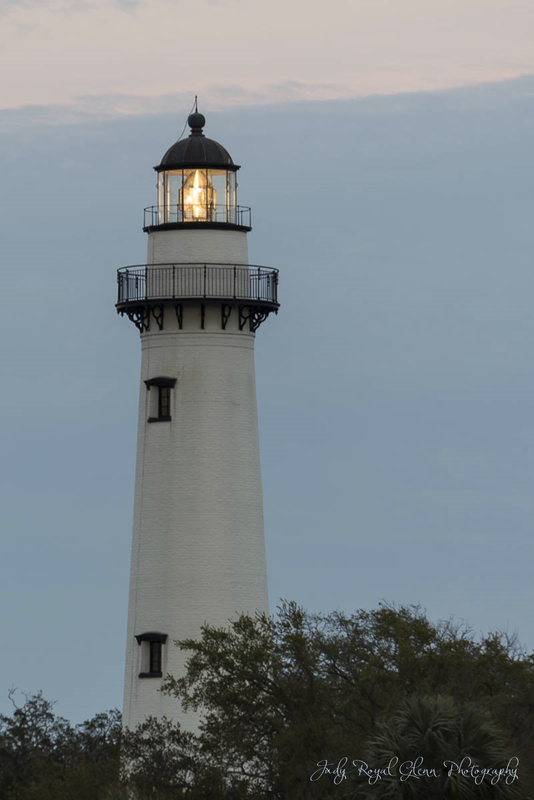 As I was doing my wildlife photography, I took the time to photograph the beauty of the St. Simons Island lighthouse.